Rich blends of Hungarian Paprika, mustard, kosher salt, garlic, onions, and parsley with combined with hickory smoke. These dry rubs are designed in small batches where quality is controlled and managed for the avid barbecue griller or once in a while barbecue cooker. These Dry Rubs contains ZERO Sugar and is based on a pure foundation of flavor. Memphis Blues Sugar Free Rub: Pork, Brisket, BBQ Ribs, Chicken, Grilled Chicken Wings, BBQ ribs, fish, pork, turkey, steaks and more. 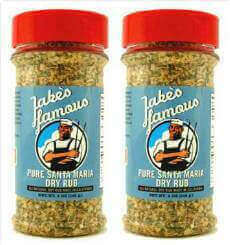 Order Jake's San Ysidro Style (SFR) and Memphis Blues Dry Rubs Now and kick your bbq dry rub skills into high gear. Get Your San Ysidro Memphis Dry Rub for Sale 20% OFF Today!